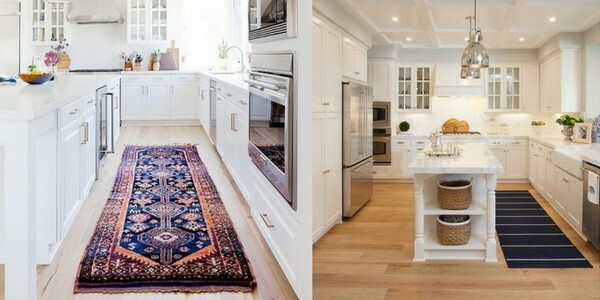 When it comes to choosing the best kitchen rugs, a kitchen isn’t often the room people first think when it comes to a rug. But the problem with kitchens is that they can quite often be filled with wipe clean sides and single, block coloured cupboards and drawers. Because of this, kitchens are always slightly in danger of looking cold and a bit clinical, and it can be quite hard to decorate in practical ways that help warm up your interior. We’re here to show you that a kitchen rug can work wonders for your interior when used properly. You may be thinking about your busy kitchen, full of spills and people and thinking how it will ever successfully host a rug. But surprisingly, if you choose carefully for your specific needs – a kitchen rug can be an easy and long-wearing feature in your interior. Have a read of our guide to help you pick the perfect rug that will stand the test of time through its practical and style fit for your home interior. We know what you’re thinking, how can there possibly be any materials for a rug that would be suitable for a kitchen. But you’d be surprised. Let me show you how you what fibres to choose for the best kitchen rugs for your home, that will help inject some colour and warmth. Nylon: Nylon is a synthetic material and is ideal for a kitchen. It’s very strong and durable to a high amount of footfall, and resists staining so are the best kitchen rugs for a busy space! Polypropylene: This is a man-made fibre, but because of that is the most resistant to staining and wear. It’s very tough, and can even be cleaned with a part-bleach solution (but check with your retailer first!). Seagrass: seagrass is a wonderful natural fibre that is suitable for a kitchen rug. 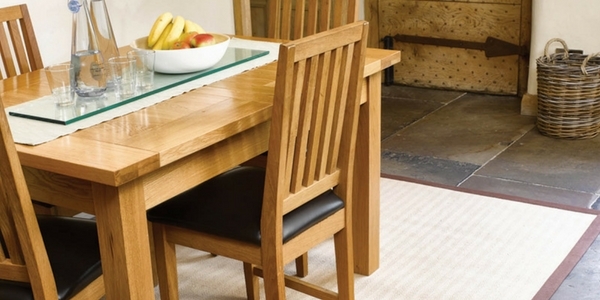 Unlike sisal or jute, it’s particularly hard wearing and resistant to staining. It’s not the softest material, but for a small rug based around the sink area, it’s perfect. Bamboo: Bamboo rugs are another durable natural fibre to take advantage of. It’s extremely hard wearing and durable, and gives a beautiful sheen. These rugs are harvested responsibly and give a lovely finished product. As with other rooms, you have to take into account what the room is like and how you want your rug to add to that space. You should always take into account the dimensions of your kitchen and what it can take. For the best kitchen rugs that cover your entire floor, you should always leave space around the borders. You should leave between 6 inches to two feet of space around the edge of the room uncovered, or you can make a room look cramped. A kitchen runner would also go along the same sort of rules. It should have equal amounts of space on either side. The end borders don’t have a rule to how far away from the edge of a room it should be, although centrally placing it so the borders are equal helps the décor remain balanced. You should always measure the space you have to ensure it fits in and looks right. Another way to utilise a kitchen rug may be to anchor a piece of furniture. The best kitchen rugs are often placed underneath a kitchen table as it unifies and warms the room while not having huge amounts of footfall on it. Use a rug shape that complements the table shape and you can use it as a statement piece. The general rule of thumb is to make sure that the rug extends around 24 inches around the table. This makes room for the chairs to fit easily and also makes the room balanced but not overly cramped. A kitchen rug can be used to provide comfort. If you place a memory foam or a rug with a thick pad underneath, it can provide relief for your feet. Place a rug by the sink or by where you chop to help when you’re standing for a long period of time. This sort of method with a kitchen rug is best if you have a lot of footfall in your kitchen and don’t want to place a larger rug down. It’s a smaller feature that can add some interest to your kitchen while still being practical. A kitchen rug can even be used in a space with a kitchen island. If you use small rugs and place on either side of the island it can help to balance the room. You can even opt for a runner alongside one side if the island. Place it around another singular feature, such as the main window of the room, and have it complement the opposing feature. When it comes to finding the best kitchen rugs, practicalities are very important. You need to take into account what the space is used for and who uses it if the rug is going to remain a permanent fixture. 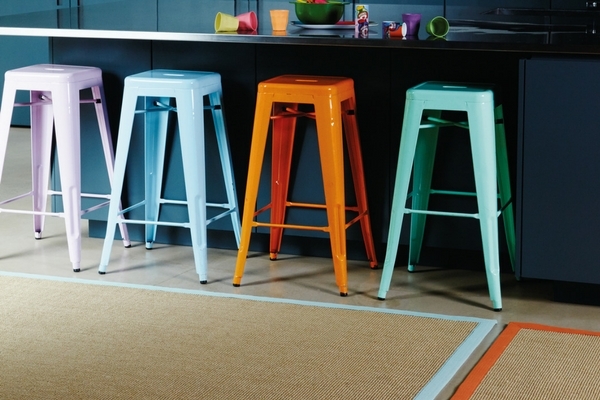 Kitchens are often rooms that have a heavy amount of footfall, so you need a hard-wearing and robust rug. While searching for a durable rug, you also need to take into account how easy it is to clean – because in a kitchen, no matter how hard you try, the likelihood of a spill at some point is quite high. For example, if you’re opting for a rug near the sink, like the one below, then synthetic materials are better as wool and cotton don’t respond well to moisture and can shrink or warp. It’s better to opt for flatweave rugs in the kitchen, as with less of a pile it has less room to disguise dropped food and hoard bacteria. Also, flatweave is easier and more durable when it comes to cleaning than a thicker pile rug which is a must for kitchen spaces. If you’re still worried about spillages ruining your rug, opt for a rug with a busy vintage pattern in a darker shade. It’s a print that is much more forgiving when it comes to spills. 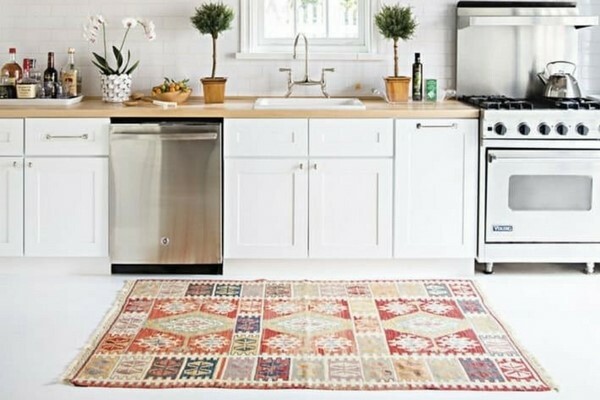 For the best kitchen rugs, it is essential to use a non-slip pad underneath your rug. Rugs can potentially prove a tripping or slipping hazard in the kitchen, where hot and boiling food is handled. Always opt to use non-slip padding to keep the rug in place and remove the risk of slipping when you’re rushing across the room with dinner! However, if you do have a hardwood floor, be careful when applying rug pads as rubber and latex pads can discolour vinyl flooring. A rug in a kitchen can be helpful to add a touch of interest to a room that can often be quite clinical, with wipe down surfaces and block colours. A kitchen rug can help to bring warmth to a room as well as added style. If you’ve opted for hard flooring, a rug can help to add insulation for the colder months to help offer insulation and padding for the feet. If you have a narrow or small kitchen, adding a runner can be help to widen the room and give the illusion of space. It helps to elongate a room, and with the border around the runner it gives the idea of more space. You can even place a runner down on one side of a central island, this can add interest to a kitchen with a rug when you have centralised furniture. Place it next to a breakfast bar to add a bit of colour and keep the flow of the room. If you have an open plan kitchen and living room, the best kitchen rugs can be used to help divide the spaces and create clear differentiation. Use a rug in the main floor space of the kitchen, between cupboard and the worktops to provide an area of distinction. If you don’t want that much floor space covered, have a small rug placed between the kitchen area and the dining or living area for a decorative ‘border’ between the spaces. When choosing a rug for your kitchen, it’s important to pin down your current interior design style so that the rug can fit well into it. If you have a rustic style kitchen, it would be better to opt for a kilim rug in a vintage and worn style, but if you have a clean and crisp kitchen something more modern would work. This interior is embracing the rustic style of the room with the kitchen rug and it works beautifully. Use your kitchen rug similarly, to create separate spaces within the kitchen and to help complement your style. 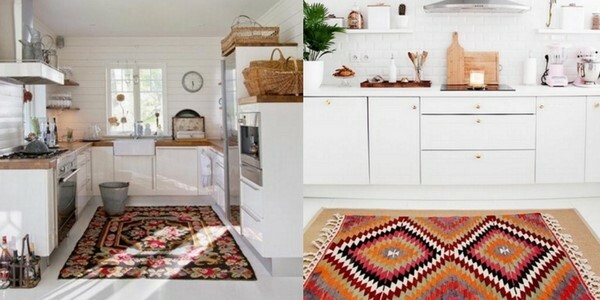 A kitchen rug is one of the easiest ways to become creative in your interior. Kitchens are usually designed in reasonably simple colours and textures, so a rug can add an interesting level of depth. Opt for interesting textures and colours to give a pop of colour to your kitchen. If you have a narrow or small kitchen, you can cleverly opt for deigns that can guide the eye to believing the room is bigger than it is. Using geometric prints or stripes that draw the eye along the length of your kitchen can create the illusion of a longer kitchen. Make the kitchen rug the feature of your room. If your kitchen has a lot of plain coloured work surfaces full of chrome and white, a rug can help to introduce accent colours to work around. If you opt for an ornate and decorative rug, you can add in vases or bread bins that complement the primary and secondary colours from the rug. If you have more of an ornate kitchen, it may be better to opt for a simple block colour rug, or even a natural fibre rug in jute or bamboo in plainer colours. Kitchens can really be transformed by the simple introduction of a rug to warm up the space. Some people consider kitchens to be too busy for a rug. 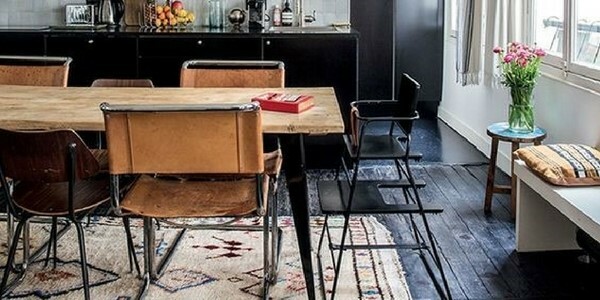 But the best kitchen rugs take into account how you live in the space and accommodate to that. By choosing the right material and purpose of your kitchen rug, you can update your kitchen from clinical and practical to warm and inviting in one simple step! So have you changed your mind on the humble kitchen rug and fancy taking the plunge for your interior? Always happy to help 🙂 I hope that you find what you’re looking for! If you add rugs in your kitchen then this can add value to your home. But it is important that you should select the best rug for your kitchen. First, you should select best rug material for the kitchen. Then shape and size of the material are also important. Also, select the best colour for a kitchen. It is important that to maintain the longevity of the kitchen you should clean the kitchen rugs. In your blog, you really give the clear idea that how to choose best kitchen rugs and that’s really helpful to the homeowners. Hi Diego 🙂 thanks for that! We appreciate the tips! Both the rugs are very colourful and beautiful. My eyes are on your kitchen’s crockery sets they are exquisitely lovely. Please tell me where did you get those??? ?.